Sorry I couldn't get this post up earlier, but I was having blog problems. 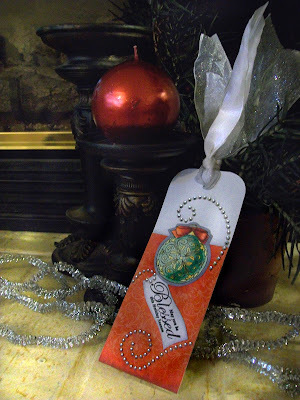 It's all fixed now, so here's the tutorial for the Just Rite Blog hop. If you look at the ornament I colored a few days ago, you'll notice that I was very careful about coloring the main ornament green and the tiny details yellow. I did not use the blender to clean up the areas, rather, I was very careful in my coloring. 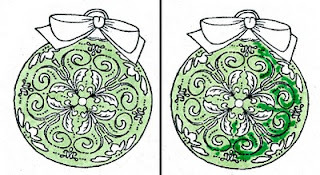 First, you want to start with the main color that you are working around the details. In this case, it was the light green. I stamped my image with Memento and made sure it had dried really well before coloring, since tiny details would show bleeding more than usual. Carefully color with the base color, G12. I used the very tip of the brush and had no problem working around even the smallest of shapes. At this point, if I had made mistakes I could still clean out the white areas with my colorless blender, but I don't really need to on this image. When cleaning up you need to have a lot of patience. dab a tiny amount of blender on, let it dry, dab another tiny amount and so on. You can't scrub in the blender like usual to clean up areas. Next, I lightly scribbled in the dark green, G17. I scribbled because I had to be careful to not oversoak the areas I want to blend, as it could easily bleed into the surrounding details. Now I can ever so carefully go back with the G12 and lightly blend the darker green out. 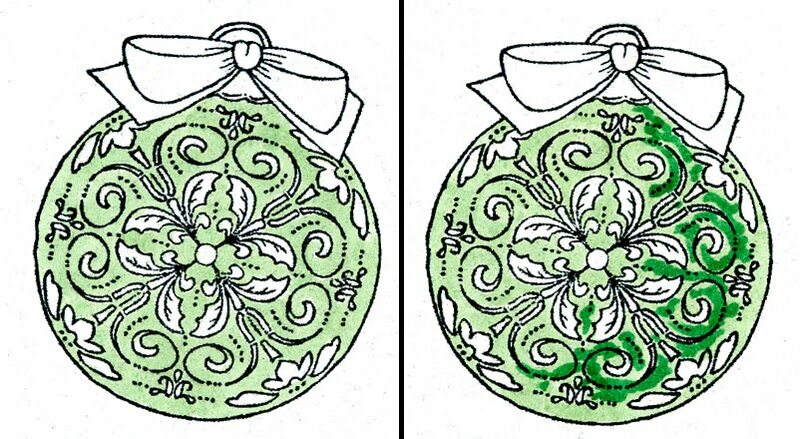 I want the areas where the darker green fades into the lighter green to be as smooth as possible to keep the dimensional illusion to the ornament. It's OK if I lose the darkest areas of the darker green. Once the blending is dry I went back with the dark green and touched in my deepest contrast again. The base colors need to be dry in order to keep the edges crisp. Now you can really see the dimension on the ornament. 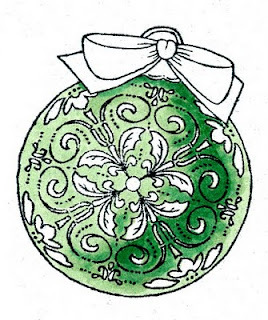 I like the high contrast between the G12 and the G17- this is what makes the ornament look so round. Finally, I colored the yellow details- lighter on the light side, and Y17 in the shadows. I was not as worried about precision, since the yellow would not show up if I accidentally colored over the green areas. The paper I was coordinating with was very orange-red, so I used YR09 and RV29 for my base red tones on the bow. Then I darkened it with R59. This helped pull the reds together. 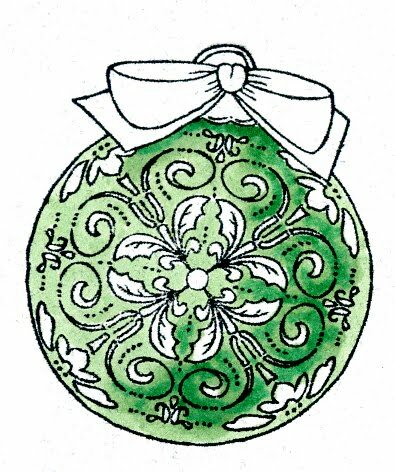 Again, I was careful to keep all my highlights and shadows consistent with the main ornament so the whole image looked better. 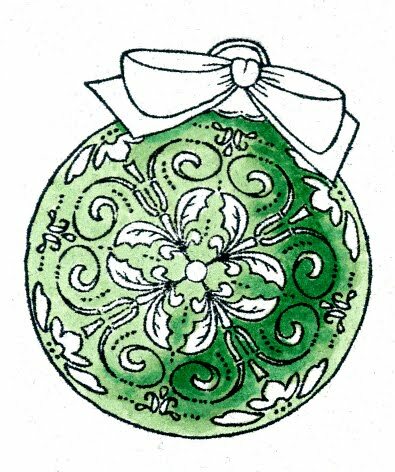 Then I colored a middle gray around the outside of the ornament, since I knew I would be cutting it out and I wanted some contrast between the ornament and the background paper, but I didn't want to cut two pieces of paper. 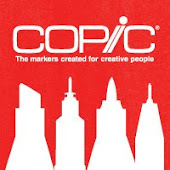 One detail that you might not notice right away on the final bookmark is that on the base papers, I wanted to coordinate the colors a little better, so where the light gray paper met the red I blended in a very light layer of C1 and C2. 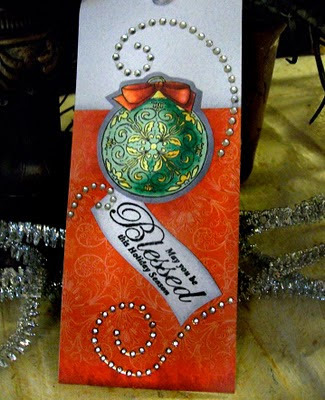 Then, under the area where the ornament is sitting I added some of the reds, again, feathering them out until it created a darker halo around my ornament that smoothly blended out to the reds of the paper. 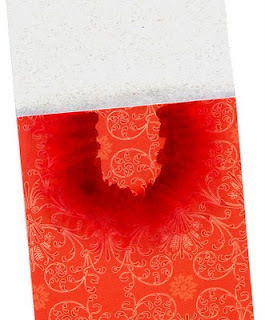 I also did this along the bottom edge of the red paper. Thanks for stopping by, have a great weekend, and I'll see some of you in a few days in Chicago!! 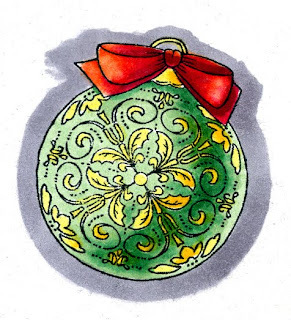 I realized while at the dentist this morning that I forgot to write the tutorial portion of this project for the Just Rite 12 weeks of Christmas Blog Hops #6! Every Wednesday up until Thanksgiving some of your favorite designers will be joining some of the JustRite design team for a series of Christmas blog hops, showcasing JustRite’s entire Christmas Collection of stamps! 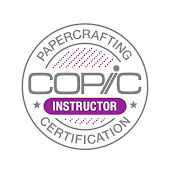 This week, it’s most of the Copic design team and Certification instructors! So mark your calendars for Wednesdays at 9am Central for great Christmas gift, card & project ideas, starting at the JustRite Inspiration blog! 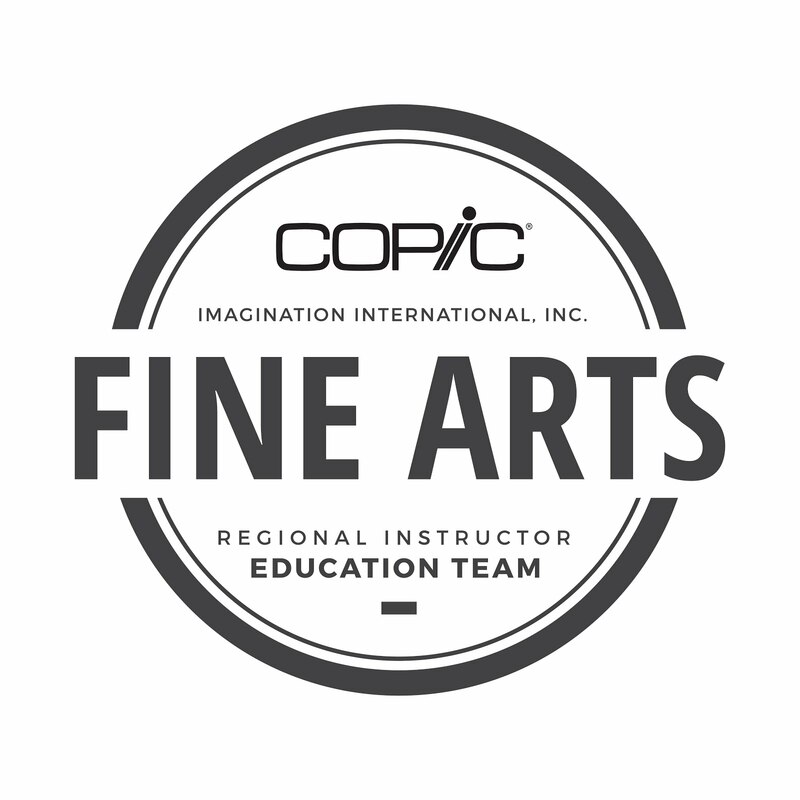 You may think that I have fallen off the face of the internet, and I do apologize, however, I have been polishing up the new Intermediate Certification manual (which is going to be jam packed with information) and getting ready for Chicago next week. My project today was made with the new Christmas Ornament Set and Christmas Nested Frames & Occasions set from Just Rite. I colored the image using G12, G17, Y13, Y17, YR09, R29, R59, C1, C2, C4, and 0. The background paper is from the Cosmo Cricket Everafter collection. I thought it paired perfectly with the pattern on the ornament. The pale gray paper is a textured paper I've had for years. 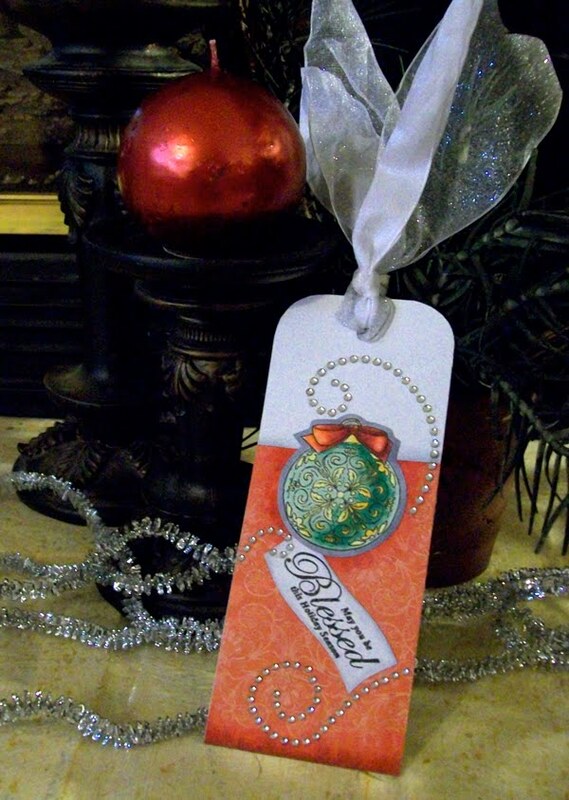 The bling is from Prima, and the big ribbon is from Offray. Thanks for stopping by today, and I'll be sure to type up the full tutorial tomorrow.